Published by Rowanvale Books Ltd. 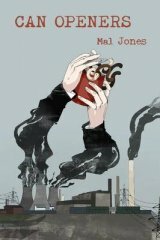 In his debut novel, Mal Jones raises concerns about the way the welfare system is run as a target-driven business, rather than as a caring and compassionate helping hand. This frustration is the motivation behind Can Openers, an intense dystopian thriller exploring our current systems and where they may lead us. Having worked in the public sector for thirty years, Mal has seen many front line workers doing their utmost to offer support and compassion in very difficult times; he is concerned that the welfare budget is being run as a business, where private companies make vast profits from those who are unwell and in acute distress. Mal’s novel reflects his fear of what could happen if we do not stand up for the welfare state and where the present policies on austerity could lead. A scathing attack on the privatising, profiteering, cheating and chiselling, systematic grinding of the sick, aged and the poor; that characterize the health and social security systems. I enjoyed the book written by a skilled,and creative author who has detailed first hand knowledgeof the wefare system and its flaws.The author recognises how poor,disadvataged and marginalised groups of people can be let down by the very system that they are dependent upon. A great story with uncomfortable messages for where we are now in the 21C and sadly the shape of things that may befall us. Really recommend as a read you won't want to put down! Thought provoking well crafted analysis. Enjoyable read, definitely worth exploring this book. Glè mhath! Fantastic book and in my opinion just a small taste of things to come in the future of our society! A refreshing and addictive read .A book that has everything humour ,suspense, romance, intrigue and a both optimistic and pessimistic view of the future in Britain. A great read which is thoroughly entertaining and t deserves top prizes in every category. A frighteningly realistic and believable view of how welfare will be administered in the near future. A clever, sharp-witted read based on perspectives of the system most of us have hitherto not considered. Contemporary view on a future that is rapidly reality! Marvellous insight into the horror the west is turning into. Fantastic insight. Mal can see in to the future.